"Creamed spinach, made with the frozen chopped variety, perfectly complements the roast, and it can be made up to two days ahead." Combine milk, spinach liquid and garlic in a 1-quart microwave-safe measuring cup or small bowl covered with a saucer, and microwave (or heat slowly in a medium saucepan) until very hot and steamy. Let stand for 5 to 10 minutes to soften garlic. Melt butter in a Dutch oven over medium-high heat. Whisk in flour. Add hot milk mixture all at once, then whisk until smooth. Stir in spinach; cook until sauce is thick and bubbly and spinach is tender but still green, about 5 minutes. Stir in cheese, nutmeg, and a generous sprinkling of salt and pepper. Serve hot. 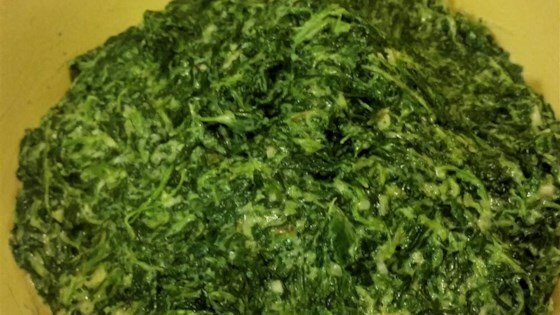 After adding spinach to sauce the mixture can be turned onto a large rimmed baking sheet to cool quickly, then transferred to a covered container and refrigerated up to 2 days. Warm slowly over low heat. Stir in cheese and season with nutmeg and a generous sprinkling of salt and pepper. Serve hot.